Very little written history of Questa’s historic church exists, although there are many family memories and more recent experiences to explore. Listen to interviews at QuestaStories.org; enjoy, learn, and contact us to add your own voice to this growing cache of important stories. Today this once-damaged historic church is re-consecrated and again an important hub of the community. It is also a site of pilgrimage for the faithful, for local artists who paint the beautiful architecture beneath the soaring mountains, and for local craftspeople who take inspiration from the re-created fixtures and features. 1836 – Canon del Rio Colorado land grant; first church built in Rio Colorado – Oratorio or Capilla at another location. 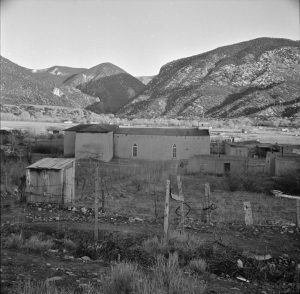 1840 – “El Oratorio” is built; a place of prayer and religious congregation, on the outskirts of Questa by the side of Cabresto Creek, just south of State Hwy 38, under a cluster of old cottonwood trees. This site is now abandoned. 1842 – Rio Colorado (now the village of Questa) officially founded, San Antonio Church probably begins construction. Mid 1840s – late 1850s – construction of Rio Colorado church underway. 1855 – Ponderosa pine trees harvested on Flag Mountain for roof vigas on San Antonio church, mules used to skid logs down to Questa, while some vigas were carried by hand by the men. 1873 – New church reported as existing in 1873 as part of Rio Grande to Denver Railroad map, and railroad stations connected by stagecoach and freight wagon. 1899 – Roof renovation of church, names found written on ceiling boards with 1899 date. 1942 – Msgr. Glenn Patrick Smith – first resident parish priest in Questa. He had a ham radio and speakers, and kept the village informed during WWII. 1943 – Single central bell tower at St. Anthony Church in old photo. 1950 – Two bell towers at St Anthony’s Church shown in old photo. 1972 – Major renovation of church, repair of west walls. 1999 – Renovation by Cornerstones historic preservation group, bell towers extended. 2000 – Limestone whitewash over exterior adobe bricks. 200? – Adobe color plaster over lime stone? Must have occurred sometime then? 2008 – West wall of St. Anthony’s church collapses. Repairs to the adobe walls undertaken since the 1970s had neither been lasting nor successful, resulting in continued degradation. An effort in the late 1990s to preserve the original east wall left the old wall intact but unstable, hidden and crumbling behind a facade. 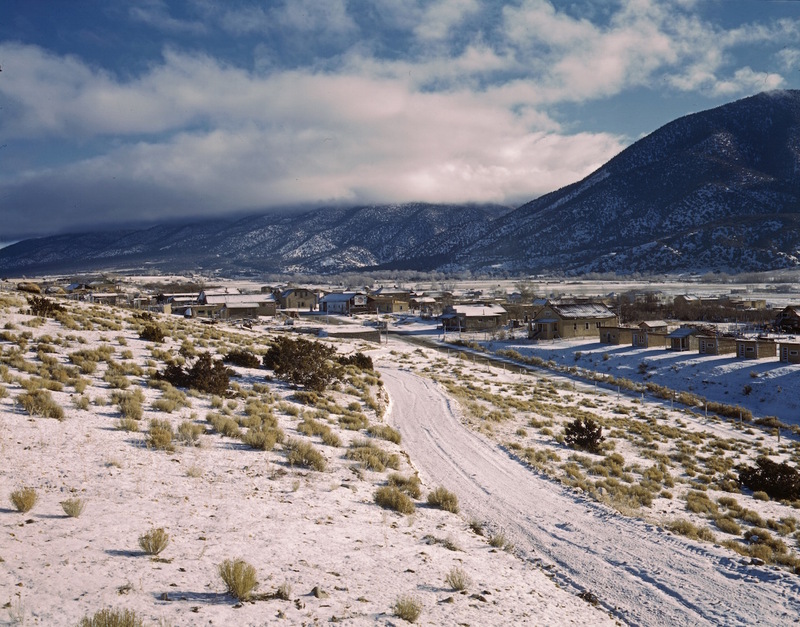 2009-10 – Many, but not all parishioners, community members, and Village of Questa want to save the church. Priest and Diocese of Santa Fe want to demolish the old and build anew. 2011 – San Antonio church declared a historic building suitable for preservation. 2011 – Archdiocese relinquishes control of St. Anthony’s Church to San Antonio del Rio Colorado Preservation for six years to complete restoration. 2012 – West wall completed. 2013 – East wall completed. 2014 – Back/north wall completed, heating system and subfloor. 2015 – Front portal finished and exterior brown coat, electric system in place. 2016 – Plaster coat and paint inside, new floor, sound system, altar screen, retablos, and stained glass windows installed. 2016 – August 8, 2016, dedication mass at completed church. 2017 – Final landscaping and color coat.